يضمن فندق فندق مانترا بيل سيتي الذي رمم في 2013 لزائريه قضاء وقت ممتع في هذه المدينة الخلابة سواء جاؤوا في رحلة عمل أو سياحة. إن موقعه الجيد الذي يبعد 10 km فقط عن مركز المدينة يساعد النزلاء على الاستمتاع بمعالم المدينة ونشاطاتها. يضفي محيط الفندق اللطيف وقربه من أكثر المعالم السياحية جذبًا سحرًا خاصًا على هذا الفندق. يقدم فندق مانترا بيل سيتي خدمات لا غبار عليها وكل أشكال اللياقة وحسن الضيافة اللازمة لإسعاد ضيوفه. يمكن للنزلاء الاستمتاع بالميزات التالية: خدمة الغرف على مدار الساعة, مكتب الاستقبال على مدار الساعة, مرافق مخصصة لذوي الاحتياجات الخاصة, تسجيل وصول/خروج سريع, تخزين الأمتعة أثناء إقامتهم في هذا المكان الرائع. استمتع بوسائل الراحة الراقية في الغرف أثناء إقامتك هنا. بعض الغرف تتضمن تلفزيون بشاشة مسطحة, سجاد, بياضات, مناشف, إغلاق لمساعدتك على استعادة طاقتك بعد يوم طويل. سواء كنت من محبي الرياضة أو كنت تتطلع لتفريغ عناء نهار صعب، ستجد خدمات ذات مستوى عالي بانتظارك كمثل مركز للياقة البدنية, ساونا, حمام سباحة خارجي, بلياردو, حديقة. مهما كانت دواعي سفرك فإن فندق مانترا بيل سيتي هو خيار ممتاز لإقامتك في المدينة. العقار يطلب مبلغ تأمين مسترجع بقيمة 400AUD عند تسجيل الدخول. The high marks are because the room was spacious and facilities were excellent, including a full size fridge and cooking facilities. Bed was comfortable. BUT the room is overdue for renovation. Parts of the kitchen area veneer is cracked or missing and the carpet had ripples so severe we had to be careful not to trip over them. The hotel was not full. I was very disappointed to be allocated this room. Clean room, friendly staff made it a hit At check in. The chill Restaurant food was Delicious & staff were very helpful. One young male staff went out of his way to ask if he could help with our grandson, I’m warming his food etc. as we were babysitting on this visit. The only downside was it was quite far from the City & West Footscray. We were happy with our stay. The room was clean and of a good standard. Free wifi would have been nice and the pool would have been perfect if it was heated. 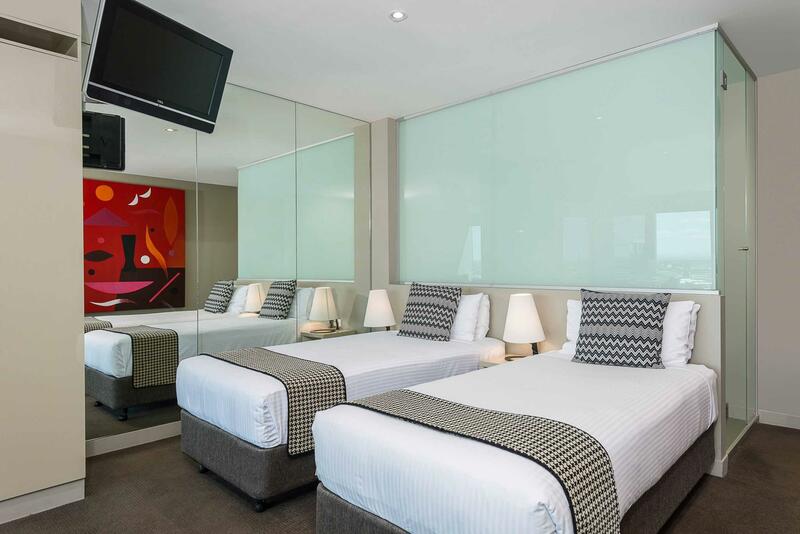 Hotel is in the northern suburbs and not ideal for those wanting to spend their time in the city. We stayed in this hotel 5 nights. On the 2nd day, the housekeeper only set our bed up, didn't change the bed sheet and vacuum the room. On the 25th Dec, they didn't clean up our room. A complain was made to the reception, he said that the clean up room should has been made based on request during Xmas, the 25th and 26th. But we have not been informed earlier. The staff brought the vacuum cleaner to our room and told us that since the complain/request was made in the evening, about 6pm (after we came from travelling that day) its our responsibility to clean our room ourselves and put away the rubbish ourselves!!! The management should have informed the guest if a request should be made on special days!!! On the 26th Dec, we requested to clean up our room. But, they only brought towels and put away rubbish, did not change the bed sheet and vacuum the room. The room service given was gross!!! Overall: 1. During our 5nights stayed, they had never changed our bed sheet, only vacuumed our room 2times after complains were made. 2. The toilet flush didn't work on the 2nd day. 3. The internet connection was extremely worse. We only could access the internet for 1 night after complains made to the reception and talked to their IT! Indeed, the internet connection was good in the reception area, but not in our room!!! Clean, large room. Very good value. Lovely, accommodating staff who met my request for a quiet room and terrific cleaning staff who serviced efficiently each day. Reception were very quick and efficient, the room was quite large and pleasantly decorated, photos of the motel were accurate, windows were soundproof, comfortable stay. Trip from airport was straight forward and tram transport to the city is about 100 metres. The room was not so clean, the floor was stiched and didnt seem that much worth it for the value... However the staff were friendly enough. Our breakfast was misunderstood however the receptionist offered us a great dinner on the house with wine! Hot water pressure dropped considerably in the morning as compared to my evening shower. When phoning room service for a meal, it took four goes to get me through to the restaurant. Overall, a pleasant one night stay. Firstly the staff was very helpful and friendly. Secondly the hotel looks very classy and clean. Thirdly the room was very clean and welcoming! I found the staff to be very helpful and friendly. 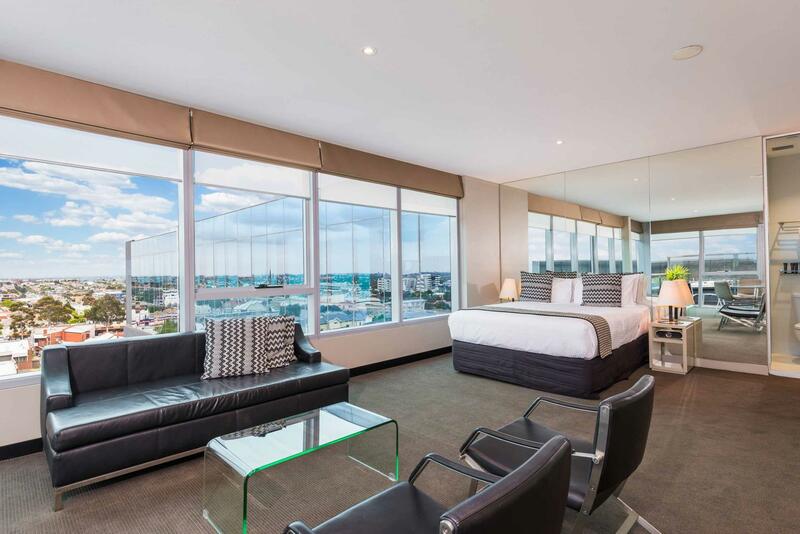 My room was clean, spacious and very comfortable and exactly what was needed for my short stay whilst in Melbourne. 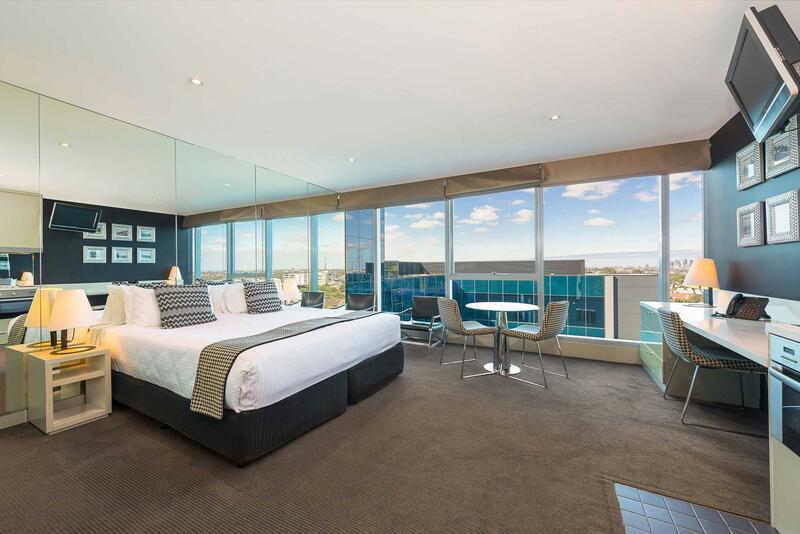 I would have no hesitation in staying there again when in Melbourne. Our actual stay was great as we've stayed here before, however, this time we dined in the restaurant. Unfortunately we both found the food very average which in turn made it very overpriced!!! Don't mind paying but please serve something that's at least on par with what I cook at home! The staff at Rydges were more than helpful, after i found myself in an awkward situation stuck in melb with no cash or credit card. As i had stayed there the night before they persevered until they could get me a room. I cannot thank the staff on that particular night enough. Over all the excellence of the Hotel is outstanding. cleaning is a big problem here - i wold never stay again. the bathroom was mouldy, the wrong room was given twice so we had to walk around the hotel at night with our luggage after a long flight, the shampoo and conditioner was missing, a draw was broken and wouldn't shut and had rust on it, the clocks were wrong and the lift was broken. somehow the reception staff manage to be nice. 3mth old baby nearly bitten by white tail ended up bitting my partner on his 40th bday so whilst changing roms we missed the sunset n we given a beer wine or coffee 1st room had mould in the shower so was upgraded to 2 big beds n bigger room witch had bathroom in middle of beds with a step up or raised tiling that we both I think broke our toes on.. IT COULD USE A SPA AREA TOO.. POOL ALWAYS TOO COLD LIKE THE BREAKFAST!! I would have liked to have been told I was in a longstay room so there was no room makeup. The cafe was not open on the weekend during our busy conference which made it difficult, we left to eat elsewhere as the asian group took over the buffet. Good rooms for the price.